Clouds do not simply provide spectacular views to uplift the soul and sooth a troubled mind; they also provide clues as to the strength of a thunderstorm. Cloud watching is really important if you reside in an area where tornadoes frequently occurs. A number of cloud formations indicate tornado development; one of which is tail clouds. Tail clouds refer to low-lying, horizontal, tail-shaped clouds stretching from the outflow region of a supercell thunderstorm on to a wall cloud. 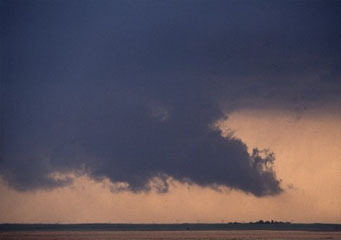 These clouds are often seen attached to a wall cloud, pulling out towards the north or northeast. In fact, the tail cloud is one of the associated features of a wall cloud together with the collar cloud. In a huge supercell thunderstorm, rapid upward movement is often detected near the location of the wall and tail clouds. This movement is very crucial as it strongly indicates cyclonic rotation and a potential violent tornado. At What Height do Tail Clouds Appear? Tail clouds are usually attached on to a wall cloud and stretch out horizontally. Therefore, they can be found at the same elevation as wall clouds, that is, around less than 6,500 feet from the ground. A tail cloud develops from the outflow of a supercell thunderstorm which contains a lot of moisture. In most cases, these clouds are often confused with Beaver’s tail. However, a Beaver’s tail is attached to the cloud base of a supercell thunderstorm, while a tail cloud is attached to the wall cloud. How do Tail Clouds Form? Tail clouds develop as a result of the condensation of warm and humid air in the outflow or downdraft region of a supercell thunderstorm. It occurs when the cool air from the outflow lifts the relatively warm air near the Earth’s surface which condenses upon ascent. As the thunderstorm updraft gathers more moisture from the surrounding air, the cloud elements from tail clouds tend to move towards the wall cloud which is likewise taken into the updraft. This causes rapid upward movement as noted on the junction of the wall and tail clouds, further suggesting the presence of cyclonic rotation or mesocyclone. What do Tail Clouds Look Like? These clouds appear like shredded bands of clouds and fractus clouds protruding from the wall cloud in the direction of the outflow region of the supercell thunderstorm. The tail cloud has an extremely dense texture and color which make it quite frightening. In fact, it closely resembles a tornado that has gone horizontal. Its shredded appearance is due to the intense wind shear occurring near the ground. How common are Tail Clouds? These clouds are very widespread during the tornado season which runs from April to July in the U.S. Although tornadoes occur in many parts of the world, the highest incidence of tornadoes is in the United States, especially in parts belonging to the Tornado alley. Tail clouds can be an awesome sight, but above everything else, don’t compromise your safety just to take a beautiful shot of tail clouds developing with wall clouds as a tornado might just be around the corner.